Track is now in place to north of Liberty, and the excavation extends to south of King leaving off where previous intersection work had already rebuilt the track. Toronto Water construction continues between King and Queen. Work on Dufferin by Toronto has now shifted to the section between King and Queen leaving the road south of King free for TTC trackwork to begin. 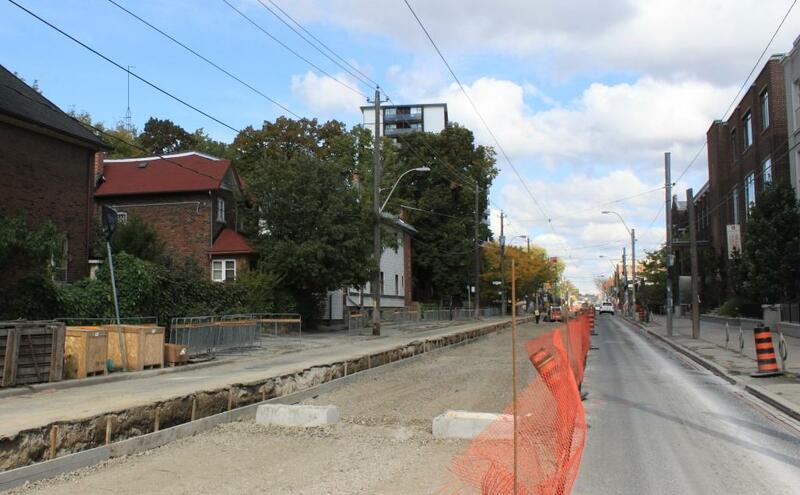 The right-of-way has been excavated north from Springhurst (the north side of Dufferin Loop) to Liberty Street. In another thread, some readers talked about track drains. Here is a new drain on Dufferin. 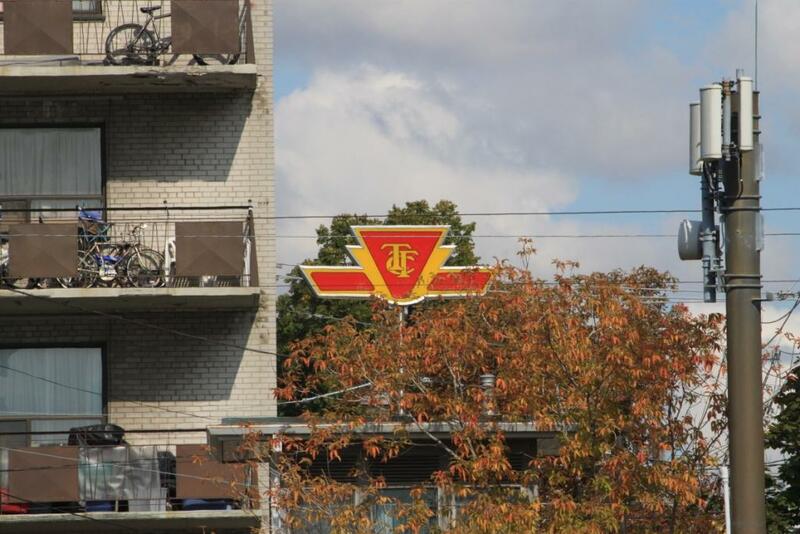 The old TTC colours survive in places around the system, including the sign at Dufferin Loop. The shape of the TTC logo seemed to have changed too. I’ve notice that the bottom round edge is a little more sharp than now. I was under the (wrong?) impression that this section and Dufferin loop was to be or already had been abandoned by the TTC. Correct me if I’m wrong, but I haven’t seen a streetcar utilize this section for years. Steve: The section south of King is routinely used for short turns on the 504 King route. North of King, construction at Queen caused the overhead to be disconnected and this track has not been useable. It was (and will become again) a routine diversion and short-turn route for cars on King and on Queen. Will they be leaving some tail tracks to connect with the eastern Exhibition loop for some later date, if? If the Waterfront West Light Rail Transit line is ever made (after the end of the current regime), and they use TTC gauge for it, the tail track could also connect with that as well. Steve: This project does not extend south into the loop area, and, yes, the WWLRT would be TTC gauge as it uses the Harbourfront and Long Branch trackage. The right-of-way? Maybe the wrong term? Steve: We can dream, can’t we? 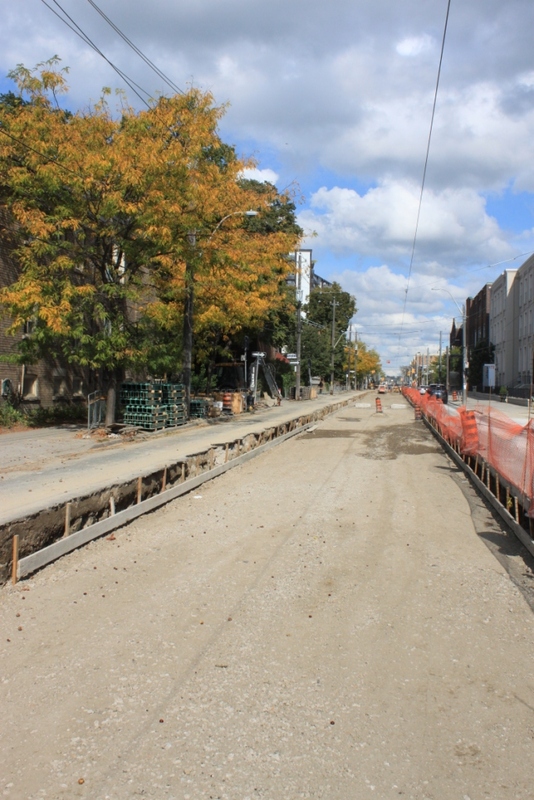 Speaking of track work and right-of-ways, is that a temporary private-right-of-way on Queen Street east of Roncesvalles? How was the impact on traffic, and what were people’s reactions to this practice? Nice new overhead is in place on the curves at Queen and Dufferin, and the supporting wires and hardware has been installed south of there. Tracks don’t look touched (yet?). Steve: Toronto Water is working south of Queen first.